"Katie and Eric sitting in a tree.... K-I-S-S... " okay okay, you get the point. I couldn't have helped but to sing that song in my head when they were doing just that! The moment that I met Katie and Eric at the local Collective coffee shop, I knew that they would be an enjoyable couple to spend my Sunday evening with. 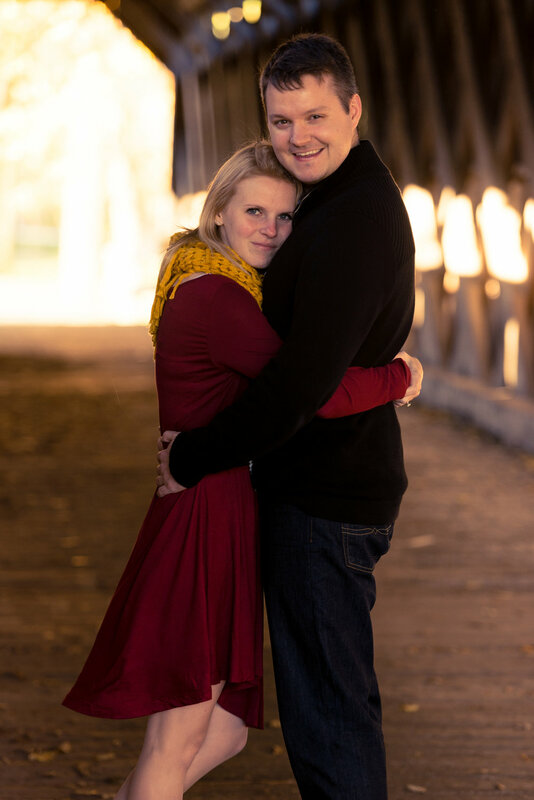 They mentioned that they had their sights set on Cedarburg, Wisconsin for their engagement session. I couldn't have been more excited to check out their favorite spots around the town. We started at Covered Bridge park, which was (not so surprisingly) quite populated with many other family, engagement, portrait session for a Fall Sunday evening. I am so happy to celebrate the love between these two, stay tuned for their wedding photos next year!